This training courseware title provides everything you need to professionally deliver Word 2010 - Intermediate training including editable training manual, hands-on exercises, exercise files, detailed instructor guide, classroom-ready PowerPoint slides, and unlimited online learning licensing. Seeing is Believing This sample manual to teach Word 2010 - Intermediate is in MS Word format. Office Word 2010 is a word processing program used to create professional looking documents of nearly any type. It allows you to add tables, charts, art, shapes, photos, and much more. Our writing team has created training materials to accurately and effectively teach the functions and features of this valuable software. 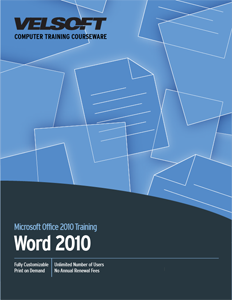 Our training materials for Office Word 2010 have been professionally designed to provide instructors and students with the most comprehensive training resources to compliment Word 2010. Experienced and inexperienced students alike will benefit from our professionally developed training materials. The average user of Office Word 2010 has not been properly trained to use the program to its fullest potential. Most users figure out the basics of the program so they can “get by.” Our training materials, however, begin by properly introducing users to the basics of Office Word 2010, and then continue to teach on this solid foundation of knowledge. Our training materials for Office Word 2010 have been designed to engage students so effectively, that their learning experience directly and positively impacts their workplace performance.